Creative musical fun for everyone! One of the aims of the Sherborne Abbey Festival is to foster a love of music from an early age. To this end, a Saturday morning workshop is a regular event at the Festival, when workshop attendees spend the morning working with professional musicians, culminating in a joint performance. The workshop format has been adjusted this year and the final (FREE) concert, to which the public is invited, will take place at the Stuart Centre immediately following the workshop, rather than in the Abbey later in the afternoon, as in the past. This means that although the workshop will be the same length, the total time commitment will be less. We hope that potential attendees will find the change beneficial. It is also possible to observe the workshop free of charge. Samba is the most typical and easily recognisable music of Brazil, but has its origins in Africa in the religious traditions of Angola, the Congo and Cape Verde. It was brought to South America via the West African slave trade. Common throughout Brazil, it is most frequently associated with urban Rio de Janeiro. 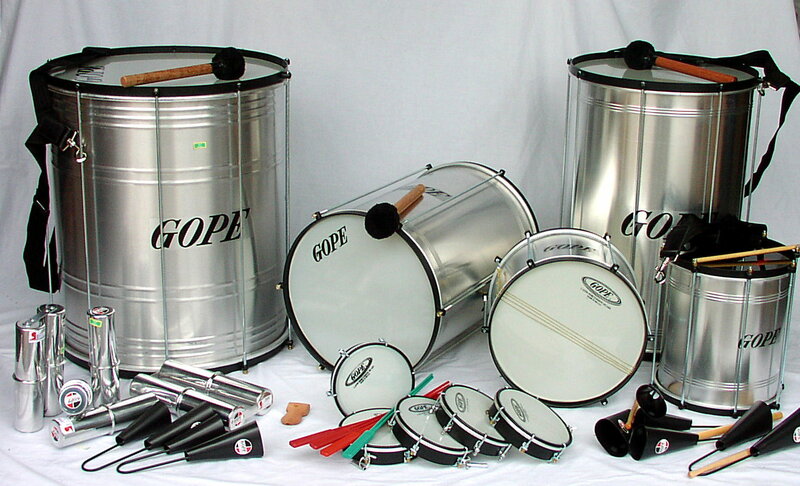 A Samba band, or Bateria, normally consists of a selection of lightweight percussion instruments. These include tamborims which are small, hand held drums, snare drums or caixas, agogô bells which are hand held double bells with a cowbell sound, played with a wooden stick, surdos, the large, aluminium framed bass drums and ganzas, or shakers. This fully interactive workshop, presented by The Music Workshop Company, is suitable for all ages and abilities and provides the chance to experience the fun and passion of the Carnival. Explore the infectious rhythms of Brazil and make acquaintance with instruments such as the Surdo, Tambourim and Ganza. The morning ends with a Samba Band performance. All Music Workshop Company musicians are professional music facilitators or workshop leaders, who teach and perform at the highest levels as soloists, with their own ensembles, in recording sessions and with top orchestras. The workshop costs £10, which includes snacks for the morning break. Closer to the event all participants will receive additional information, including directions to the venue and a final schedule. BOOK ONLINE NOW, buy tickets at Sherborne TIC in Digby Road or call 01935 815341.